It may be relatively small in size, but Puerto Rico has more than its fair share of attractions — beaches, rainforests, caves, bioluminescent lagoons, ancient towns, and its own stellar music and cuisine, to start. But it’s precisely because of its size that the island offers something else to travelers: prime road trip potential. Rent a car and hit the road for a week with this awesome seven-day itinerary. From the airport in San Juan, you’ll take PR-26 towards PR-66 to reach Rio Grande. From here you’ll drive to your first stop, Las Cabezas de San Juan Nature Reserve, by hopping on the PR-3 S, a ribbon of highway that takes you by popular spots like El Yunque Rainforest, the Luquillo food kiosks, and Luquillo Beach. You’ll get glimpses of the blue-green ocean as you drive to the second-oldest lighthouse on the island. Found on the easternmost tip of the island, Las Cabezas de San Juan Nature Reserve protects seven ecological systems, including a bioluminescent bay, dry forest areas, coral reefs, mangrove swamps, and several beaches. You’ll set to see huge iguanas, fiddler crabs, and exotic birds. There’s also a short-but-beautiful boardwalk through mangrove trees that takes you to Laguna Grande, a bioluminescent lagoon that glows at night. Take PR-53 south, then PR-30 towards Caguas, and PR-52 to Cayey. 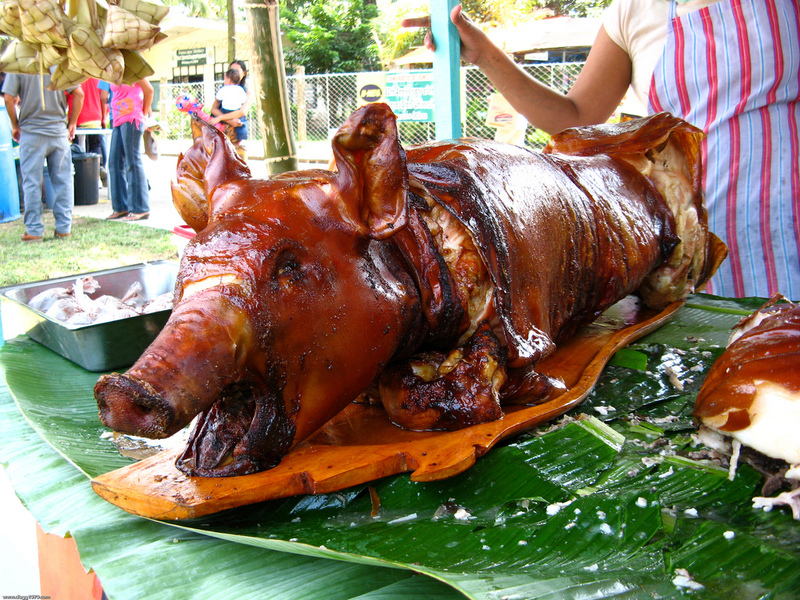 Pork lovers come in droves to this culinary paradise where lechoneras serve some seriously delicious roasted pork. The road lies high in the mountain town of Cayey, making for a beautiful drive. Anthony Bourdain and Andrew Zimmern call Los Pinos restaurant the best place to get your pork fix. Their lechón asado is tender, salty, and smoky, and they serve a side of the crispy skin, called cuerito, popular for its more pungent flavor. Take PR-52 south to reach Ponce. Hacienda Buena VistaPonce, Puerto RicoPonce is Ponce. Rural part of Ponce the Pearl of the South. Ponceños will tell you that “Ponce is Ponce,” meaning this city on the island’s south coast is one of a kind — and they’re right. It’s the second largest city in Puerto Rico and a hub of culture, history, and good food. Other nearby places to visit include Castillo Serrallés, the former home of the founders of the popular rum Don Q; Hacienda Buena Vista, a coffee plantation in the rural part of Ponce; Caja de Muertos, a stunning island eight miles off the coast with white-sand beaches and clear waters; and the Tibes Indigenous Ceremonial Center, home to the most important archaeological site in the Antilles. After all that, stop by La Guancha for local food, music, drinks, and a view of the marina. Take PR-52, and then PR-2 towards PR-116. Follow the PR-304 towards La Parguera. La Parguera is a small fishing village on the southwest coast where a bioluminescent bay, tiny islands, and amazing views can be found. Rent a boat or take a tour to explore the coastal waters and colorful houseboats, the islands of Mata La Gata and Caracoles, and the mangrove swamps. At night, catch the glowing light of the microorganisms that live in the lagoon. Head north to PR-2 W, then take PR-115 to Rincón. Aloha SurfAguada, Puerto RicoCatch waves either on the north at Pool’s, Sandy Beach or Antonio’s or on the more southwest facing beaches, Tres Palmas, Maria’s and Domes. Head to the beaches of Tres Palmas and Domes in Rincón to catch surfers in their element.This area is great for snorkeling, surfing, whale watching, hiking, and swimming. And when you inevitably get hungry, try the food trucks by the highway and brunch at one of the many restaurants around town. Take PR-115 to PR-2 N. Turn left on PR-443, right on PR-110, and then follow PR-464 toward Isabela. Back on the island’s north coast, drive to the town of Isabela for otherworldly views from the road, a snorkeling paradise called Blue Hole Coral Reef, and the historic Guajataca Tunnel. The tunnel was built in 1911 as a railroad passage to connect Isabela with Quebradillas and is now used by visitors to reach Playa El Pastillo. A nearby stop for some outdoor exploration is the Guajataca Forest Reserve, a subtropical dry forest with many interpretative trails. Take PR-2 to PR-22 up to exit 42A (road 137) towards PR-2 again. Turn right and take road 687 to 6671 east and make a stop at the beach in Vega Baja. Then it’s back on PR-22 for the return to San Juan. Puerto Nuevo PlayaVega Baja, Puerto RicoPerfect location set apart from other swimming spots on the island. Great facilities, seafood restaurants. Try the plantain soup. Stop at Puerto Nuevo Beach for a swim. Conditions here set it apart from other swimming spots on the island — the calm waters and rocky backdrop make for a clear lagoon perfect for lazy floating. After this detour, head back to PR-22 and drive straight into the island’s capital of San Juan. Stay overnight and enjoy the town’s history by visiting the 16th-century Castillo San Felipe del Morro, taste local coffee and pastries at the recently reopened La Bombonera (a local institution), and walk the cobblestone streets of Old San Juan.